No doubt you have seen couponers on tv, or in the newspaper. You have seen their treasure troves: closets and spare bedrooms loaded to the ceiling, basements that rival the neighborhood grocery store. You have probably wondered to yourself why stockpiling? Why do they need so much? Some people may go as far to call it hoarding. That’s simply not true. And as someone learning how to use coupons, it is imperative that you understand what a stockpile is, and why it is NOT the same as “hoarding”. First of all, it drives me crazy when someone thinks stockpiling is synonymous with hoarding. Since when does owning more than one of a given item qualify you as a hoarder? Hoarders have a disease, it’s a mental illness where clutter and junk overrun their homes. A couponer is stockpiling things that his or her family will actually use, kept in an organized fashion. 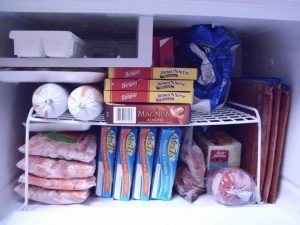 Stockpiling may look cluttered if the couponer does not have a lot of extra space, but the items are kept clean, stocked and rotated so that the items do not expire. You’re probably wondering why it is necessary to have 10 or 20 bottles of ketchup, or 32 bottles of shampoo. You’re also probably wondering if it is necessary to be a successful couponer. The answer…YES! First you must understand WHY they have so much of the items. It’s not simply a willy nilly decision to buy a bunch of something just because it’s free. A skilled couponer knows that sales cycles vary each month and with the seasons and will purchase only enough to last their family until the next sales cycle (unless of course they are planning to donate the extras). For example, let’s say you know your family averages 2 jars of peanut butter a month. If a great sale and coupon deal comes out making peanut butter free (this happens sometimes around back to school season) then you know you want to keep enough jars to last you till the next sale cycle which depending on the items could be 6-12 weeks or as long as a year. So you want to get yourself enough peanut butter while it is free to last you until the NEXT time it is free. Otherwise you wind up paying more for it, and why pay more when you know you don’t have to? In an ideal world with unlimited space, the best thing to do is to keep enough food for a rolling six month period. You could do up to a year’s worth, but that is a little excessive. Six months is good enough not only to ensure you hit the sales cycles, but it’s also like an insurance policy should anything happen to your family’s income over the next six months, you know you will have food in your bellies. You probably keep an emergency savings fund, and it’s essentially the same idea. 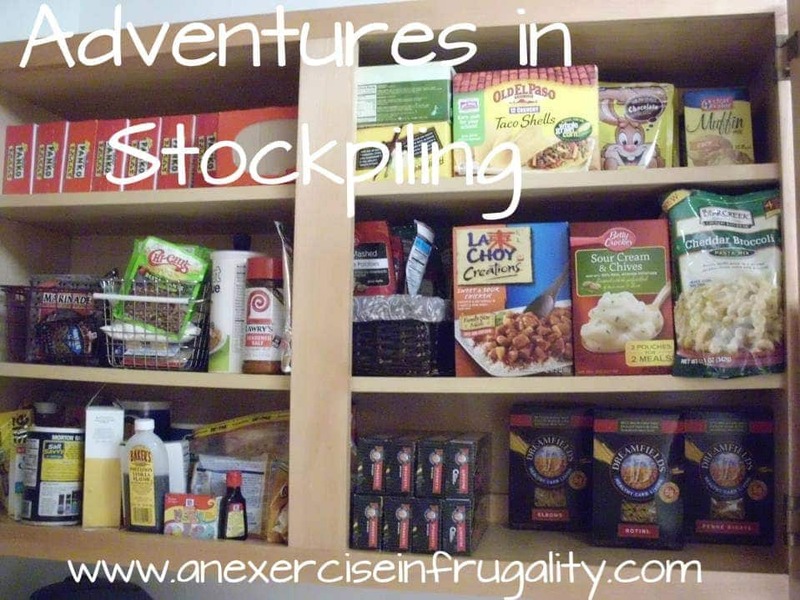 Stockpiling is especially important in our difficult economic times, and even more important if you live in an area prone to natural disasters (or zombie apocalypses). 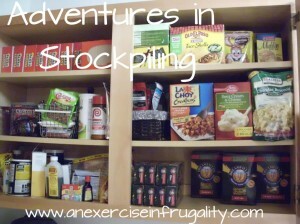 Most importantly, remember that stockpiling is NOT synonymous with hoarding. Your grandmother and great grandmother knew that buying in quantity when items were at their rock-bottom prices was the smartest way to shop, and now you know it too. Stay tuned for more tips on how to set up, maintain and organize your stockpile’s humble beginnings. Here’s some photos of my own stockpile! Keep Saving!